Alpina, or Alpina Burkard Bovensiepen GmbH for those wanting that piece of information, is a manufacturer working closely with BMW producing their own branded and registered cars. Alpina cars have always aimed to have a different, complementary personality to M cars. Their emphasis is on luxurious, higher torque cars than BMW M, with distinctive features like the 20' spoke alloy wheels and the Alpina Blue metallic paint. They lack the outright sportiness of M cars, due to often not being as high revving, offering automatic transmissions, and lacking limited slip differentials, but they offer a unique experience, with higher end materials and a more useable powerband in daily driving than high revving M cars. For those thinking the E30 M3 is overrated, and needs more cylinders than wheels, this may be the answer. 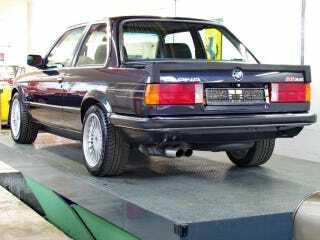 It’s got a modified version of BMW’s 3.5 straight six, good for 254hp, and a getrag 5 speed manual gearbox. If you get the 3.5S version, you can get a dogleg gearbox so you can scare your friends into accidentally reversing the car. So, with a huge straight six, a beefed up version of E30 M3 suspension, this could be a very desirable underdog indeed. The 7 series-based Alpinas have always made sense, because BMW doesn’t make an M7 (what the hell, BMW) so customers wanting a high performance version could turn to Alpina. This e38 based B12 is surprisingly understated and sports a 6 liter V12 good for 430hp, meaning a 5.8 second 0-60mph time. The transmission is a 5 speed switchable automatic. When it came out, it was the ultimate autobahn stormer, achieving the standing start kilometer faster than a Ferrari F355, yet having velour floor mats, a hand sewn leather steering wheel, and ultra-soft Lavalina leather on every surface imaginable. BMW had already tried to put a V8 in the e36, but didn’t succeed in designing a version that could be built on the regular e36 production line. Alpina did succeed, but not before undertaking 42 modifications at the BMW factory, mounting the engine from above instead of from below, and even redesigning the oil sump from the bored out 4.4 V8 so that it would fit in the engine bay. The result is a 4.6 liter V8, 333hp 3 series that will accelerate faster than an e36 M3. And yes, it is 3 pedals only. A total of 221 cars were made, including in coupe and convertible versions, but this wagon is the sleeper you want. For those believing in the fabled turbodiesel manual wagon as the cure to cancer, global warming or foot odor, this may be the Holy Grail. It’s a biturbo four cylinder diesel manual e91 3 series good for 213hp. 0 to 60mph is in the upper 6 second range, but midrange acceleration should be more than its figures suggest. However, with a four banger diesel, let’s just hope it won’t sound like farm machinery. While the 8 series was a supremely stylish and cool car, it often wasn’t particularly fast. Alpina rectified that by building a 5.7 liter V12 version of it, good for 380hp and a top speed of more than 300km/h. Alpina themselves admit that the 850csi was already a fantastic car, so this car only slightly builds up on it, with slightly modified suspension, more torque and a more luxurious interior. The car came standard with a 6 speed manual, but an option was a Shift-Tronic system boasting an electronic clutch management system. But who are we kidding; the manual is the way to go.